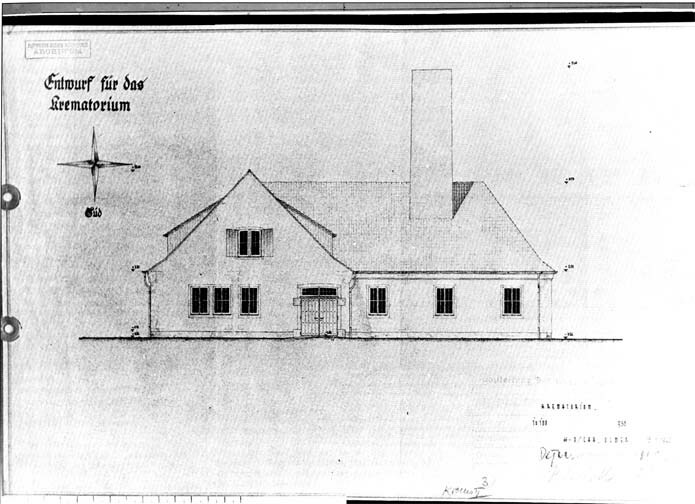 “Entwurf für das Krematorium / projected crematorium” South elevation Bauleitung drawing 938, scale 1:100 Drawn on 15th January 1942 by SS Sergeant Ulmer, checked on 28th January by SS Second Lieutenant Dejaco and approved on the same day by Captain Bischoff. After it was decided to transfer this crematorium from K L Auschwitz to K G L Birkenau, this drawing was copied and included in Bauleitung drawing 936 of 15.1.42 showing the four facades of the future Krematorium II, oriented according to its implantation in Birkenau. This façade thus became that facing east. In addition, the half-buried roof of the Liechenkeller / corpse cellar 1, located perpendicular to the south facade, was added.